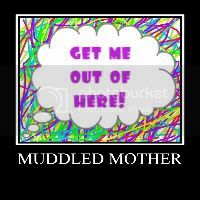 A Muddled Mother: It's Worth It. I SWORE I wouldn't do this with Ila, but now I am glad I did. You all know what I'm talking about...that "thing" that moms do....that "worrying thing." Where the littlest cough makes you wonder if they are developing pneumonia or more recently, swine flu. Or that little area of rash on their bellies that makes you pretty darn sure they have ring worm. And don't forget that the stomach cramps they developed overnight HAS to be e coli or salmonella poisoning. Admit it. How many of you...you know who you are...how many of you have gotten into bed after holding their little heads over the toilet so they can vomit, worrying--hoping-- that the chicken you served for dinner was cooked well enough? Where would we be without our imaginations right? Right! And that is the point of this blog post. Our imaginations, our constant states of alertness, although exhausting 100% of the time and useless 98% of the time, are valuable when it comes to that 2 % of the time in which we are right. There is a little voice in our heads that whisper these worries to us Mudders and we must listen to it. Sometimes it doesn't whisper, it screams like a bad actress in a horror film. Don't ignore it just because it is so annoying, lest a slasher come when you least expect it. That "worry voice" has been nagging me for months about Ila, for 8 months, to be exact. In her first weeks, I noticed that she favored her right side. Left side often still. Left leg not quite as nimble. Left arm stuck to her side. At her three month check up I mentioned my observations to her pediatrician (whom I adore by the way.) But he waved it off, explaining that some babies were positioned awkwardly while in the womb therefore making one side weaker than the other. She'd grow out of it he assured me. He'd seen it a thousand times. I blindly and numbly bobbed my head up and down. Agreeing with the smart doctor who knew so much more than me when it came to these things. Of course, he was right...after all...he was the doctor. The months rolled on and Ila very slowly began to make motions to roll. But she never got quite over from her back to her stomach. Again I noticed that she'd only use her right side to roll left. My worry voice quieted by the doctor began to nag loudly that something was very wrong. I enlisted the help of my brilliant pediatric physical therapist friend, we'll call "PT Smarty," and she gave me some tips on how to expedite the rolling process. Low and behold she rolled, only one way, but no matter. The milestone was reached, and the worry voice was hushed for a short time. As developmental milestone moments came and went, Ila would muster through all the advice that PT Smarty continually gave, but doing it in her own way, as if she was compensating for something unknown. Rolling from stomach to back, sitting, sitting up from a laying down position, each had their own Ila flair, and because of that the worry voice never really left me alone. True to her name, PT Smarty from a video...(A video!!!) diagnosed Ila as possibly having a muscular problem called torticollis. What followed was a blurry week of doctor visit after doctor visit after doctor visit which in the end only confirmed PT Smarty's brilliance. Torticollis is a sort of tilting of the neck due tight sternocleidomastoideus muscles. Had the pediatrician erred on the side of caution at her three month checkup, therapy would have been easier and more of a guarantee. But at 11 months, her therapy is difficult at best, although true to her nature she has been a trooper through the whole thing. I am truly, utterly, and infinitely grateful to PT Smarty. I will spend the rest of my days letting her know of the deep gratitude I have for taking an interest in Ila's development. But I am also grateful to the sometimes annoying, sometimes nagging voice that too often I carry as a burden. Mudders as long as the world is run by humans, as long as decisions are made by humans, as long as doctors are human and educators are human, heck ANY "expert" is human, then we must look upon them--look upon their opinions-- although educated, as ones that could be fallible due to the very fact that being HUMAN means that mistakes can be made. I truly believe that is why moms are equipped with those worry voices. To keep the mistakes from doing damage that can't be undone. So often moms are looked down upon for their opinions, for the very reason that they come from "mom," and therefore couldn't be objective. However, this experience with Ila has taught me that, while my worry voice most of the time is a horrific energy vacuum, it is there for a reason. Even if it proves valuable only once in a lifetime of worry, it will have done its job. And after all, our kids are worth it. Ah, we Mudders are all part doctor! We are the ones that spend day in and day out with our babes and know their habits and the ins and outs of their daily lives. I totally trust my inner doctor! My 9 month old nephew has torticollis as well, although his is obvious even when he is still. The poor kiddo has undergone months of physical therapy, massage therapy, etc. He learned to sit up lately, but crawling hasn't happened yet. I am glad that my sister's worry voice has persisted and she hasn't given up, even though she was told it was something that would have resolved itself by now. I love her video. She is one adorable baby! You are simply a great mom---nagging voice and all. Trust that voice, because you and Jeff are THE only voices your babies have... they count on them. Thank you so much. Even if it weren't for my connection to Smarty PT, I'd like this post - sometimes your gut just knows, and you must trust your gut! And our gut usually knows the difference between the fever that we think is meningitis, and the feeling that somehing is just "not right"
Never let someone, educated or not, tell you things are fine when you know that they are not. Always listen to your gut....it usually is right!